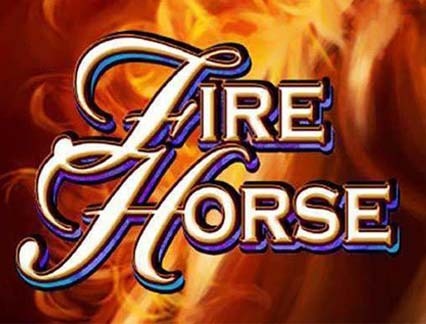 Game Information: Fire Horse is an IGT Pokie released in May 2016. The game features 5 reels and 720 ways to win. Fire Horse can be played across all devices. It is based on the Chinese Zodiac sign and can be played from 50p per spin. The MultiWay Xtra game feature allows you to win both ways. The game also has several other features including free spins and bonus rounds, scatters, and wilds. The Fire Horse mobile pokie is not some lame filly to be saddled up. With 720 ways to win, the game is well balanced and offers a decent winning during the main game. The bigger wins are achieved during the free spins where one can win up 96 free spins. The stacked wilds offer great payouts as well. Below is our review of the Fire Horse game. Fire Horse pokie has a nifty wild symbol. The symbol replaces all other icons on the game reels with an exception of the scatters and free spins. The wild appears only on the three reels found at the middle. When it appears as a stacked wild, this symbol can boost your winnings; it expands to cover the entire reel. The scatter symbol in the Fire Horse game is represented by the Ice Crystal. The scatter does not trigger any free spins but rather offers wins when it appears. When three scatters land anywhere on the reels, it pays out 2x your bet while four and five scatters pay 10x and 50x respectively. If you have played the popular Siberian Storm Slot, then you will have an idea of what Fire Horse is like. Rather than the regular pay-lines, Fire Horse has Multiway Xtra technology. The reels are set against a flame lit backdrop and have a hexagonal 3x4x5x4x5 structure. Symbols include the K, Q, and J playing cards, earthenware pots and grey and brown horses. The fire horse logo is the most paying with 1000 coins, while the fire horse carries a prize of 4000 coins, the ice horse will earn you 300 coins if you manage to land on five of them. The background screen of hot flames gives the game huge credit. The background enhances the colors used for the symbols providing the game with attractive visuals. IGT games normally are medium to high variance since they have huge jackpots. The max amount that can be won is 109,210 the line wager. Fire Horse has a house edge of 4.4% which is 95.6% RTP Payout. If you are up to take the challenge of horse riding, you can ride off into the sunset with a hoard of money! Against the backdrop of the reels are differently colored flames—red and blue. The paying symbols are the earthenware pots, grey and brown fire horses. 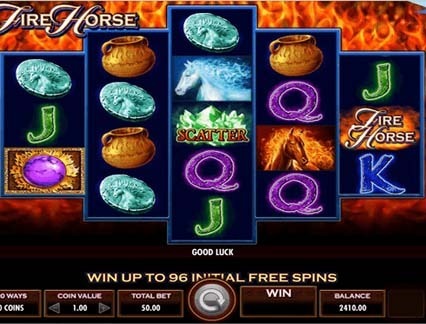 The Fire Horse logo is the most paying symbol during the base game and pays an amazing 1,000 coins jackpot. 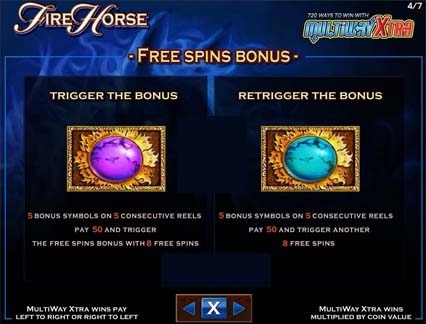 Fire Horse has a special feature that translates into free spins. The Multiway Xtra feature is only unique to this title and provides the players with a chance to win large payouts. When five purple brooch symbols appear on reels 1-5, the free spins mode is triggered giving you eight free spins. However, triggering the free spins is not that simple. The free spins boasts a Multiway Xtra combination. When activated, the Multiway Xtra feature can win you up to 96 free spins. But the average free spins is 16. The more broach symbols that appear, the more the free spins one can win. When you land four urns on reels 1-4, you get four of a kind and 75 coins. However on reel 1 you are rewarded 1 urn, 2 urns for reel 2 and 3 urns for reel 3 and 1 urn for reel 4. You will realize that this is more than a four of a kind win. The wins are calculated by multiplying the symbols together and then multiply it by the coin win: 1x2x3x1=6. The end amount, 6x is multiplied on 75 coin win.